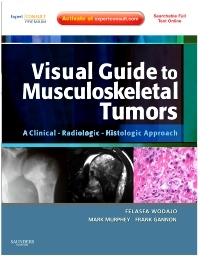 Visual Guide to Musculoskeletal Tumors: A Clinical-Radiologic-Histologic Approach, by Felasfa Wodajo, MD; Frank Gannon, MD and Mark Murphey, MD, uses a pattern-recognition approach to help you diagnose challenging musculoskeletal tumors with confidence. With an easy-to-use format, it is the only resource that correlates histology studies and imaging studies. By comparing images these superb-quality, large-scale images, you can master pattern recognition for the 30 most important musculoskeletal tumors and make informed, effective, and rapid decisions on diagnosis and treatment. Master pattern recognition and diagnosis of musculoskeletal tumors with easy-to-use templated chapters and 900 illustrations summarizing essential clinical, histologic, and radiologic findings. Make rapid, confident decisions on diagnosis and treatment by comparing your clinical findings to the book’s extensive collection of detailed, large-scale illustrations. Access the book from any computer at ExpertConsult.com, complete with the full text, entire image bank, and "self-assessment" cases to further augment mastery of the subject matter.